Now... the solution to the problem with the breathing is very easy and cheap. As a matter of fact it is free and you don't have to pay any money for it. All that you need to do is to be aware of your breathing while you work on the computer. Yes... be aware of your every breath and breathe deep. As you can see it is nothing fancy about it. It is easy and free as I have said but yet this will be one of the most difficult things to achieve. You may write yourself a note and stick it to you monitor. It will help you but even then you will get used to it after some time and you will forget about the breathing. Anyway... this is the way to go. Steady and patiently getting yourself anchored to your body with the awareness of every breath. I know that this may seem to simple to be true. But I am telling you that once you start working on it many things in your life will change and improve ( including your health problems ). Now... let's go to the next point with the radiation from the computers, monitors and other electronic devices. This is a scientifically proven fact that the computers etc. affect negatively our health. It is that our body has its own electromagnetic field and all these electronic devices emit their own electromagnetic field which influences us and with the overexposure over longer period of time it causes health problems within the human beings ( also animals, plants etc. ). Of course our body has a compensation and adaptation mechanism and we can somehow get used to it. But still when we push the limits over longer period of time then we have to pay for the consequences. One very important point... If you take care of your body and you keep fit then obviously your body will be able to handle much better the radiation from computers etc. 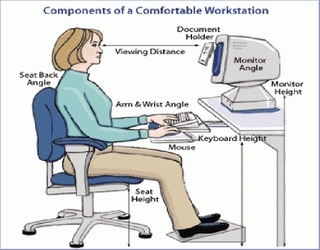 And here taking care of your body includes keeping good posture and breathing deep and with awareness while working with the computer. I have tested it on myself and just correcting these 2 points allowed me to work about 50% of time longer. So you'll see... quite often the solution our problems ( including the most complicated global problems ) is very easy. It is not that we need a lot of money and some fancy hi-tech equipment and technologies to solve the problems. All that we need to do is to use common sense and logic. And then apply it. P.S... it is confirmed... Setting the time limit for the day changes the whole thing with the computer drastically. By having the set hours which I am allowed to work on the computer makes me to plan, set the priorities and organize myself much more effectively. And as a "by-product" finally I have time to do other things around the house ...?... ( cleaning etc. ). I also have more time to take care of myself and do some nice things for myself. This is really cool. I am glad that I got this point straight.